The Joy of Vegan Baking seeks to demonstrate that being vegan is not “limiting” by presenting veganized versions of many “familiar favorites”. There are chocolate chip cookies, cornbread, rolls, cobblers and just about any other standard baked good that you can think of. All of the recipes are presented in the kind and encouraging words of Colleen Patrick-Goudreau, better known for her inspirational “Food for Thought” podcast. Unfortunately, most of the recipes are lackluster. Anyone with a basic knowledge of how to use egg replacer or flaxseeds in baking–easily learned from the Internet–could then employ those tricks on their own in typical recipes. 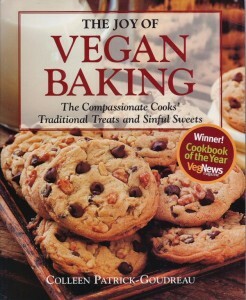 In a world full of cooking blogs and websites like food.com, I’m not really convinced that even new vegans need a cookbook to teach them to make chocolate chip cookies. This entry was posted in Cookbooks, Reviews, VeganMofo and tagged baking, desserts, vegan, veganmofo2013. Bookmark the permalink. I’ve only tried one recipe from this, the carrot cake, but I was pleased with how it turned out. Have you tried many of the recipes or have you decided against doing so because of the subs called for? There’s just nothing in this book that makes it indispensable. The bread baking chapter, for example, doesn’t include valuable tips that can’t be found on the back of a yeast packet. Everything I’ve tried turned out ok, but not exceptional. I really enjoyed the lemon bars, but the ones in Veganomicon are better. And Veganomicon also goes beyond chocolate chip cookies to offer unique creations as well. The benefit of The Joy of Vegan Baking is that it’s comprehensive, so in that sense it might be great for a newbie vegan who wants a reference book. Even then, though, I would probably recommend one of Isa’s books first.